Frederick Charles Poole was born in Yeovil on 19 September 1891, eldest of the four children of postman Charles Poole (1857-1913) and Elizabeth Jane née Perry (1859-1937). Charles and Elizabeth's children were Frederick, Emily Amelia (1892-1952), Arthur Thomas (b1894) and William George (b1896). In the 1901 census the family were living at 'New Buildings', West Hendford but by the time of the 1911 census they had moved to 10 Seaton Road. 19-year old Frederick gave his occupation as an apprentice tin smith. Frederick enlisted at Taunton during late 1914 or early 1915 (although the Western Gazette would, confusingly, later claim he enlisted "from the Post office, Cheddenfold, Surrey" and also claimed that he was still in the Somerset Light Infantry at the time of his death - perhaps confusing him with his brother who was also servine in Palestine). He joined the 2nd/5th Battalion, Somerset Light Infantry. His Service Number was 4324. The 2nd/5th Battalion was a second-line battalion and a duplicate of 5th Battalion, formed in September 1914 as part of 135th Brigade, 2nd Wessex Division. The Battalion was in India from December 1914 where they were attached to the Burma Division. Frederick joined his battalion during March 1915 after completing his basic training. The Burma Division was a static formation of the British Indian Army. It was created as part of the 1903 reforms of the Indian Army by Herbert Kitchener, 1st Earl Kitchener then Commander-in-Chief, India. The task of such formations was to oversee area brigades commanding Internal Security troops. The formation is best thought of as a provincial or district command rather than as an infantry division. The headquarters of the division was at Maymyo. In January 1916 the 2nd/5th Battalion transferred to the Rangoon Brigade within the same Division. Frederick transferred to become a Sapper in the 496th (2nd Kent) Field Company, Royal Engineers, with the new Service Number 505893. The 496th (2nd Kent) Field Company was originally the 2nd Kent Fortress Field Company. This company was formed from 2nd Line Territorials and was also sent to join 2nd Mounted Division. After evacuation to Egypt it was posted to the Suez Canal defences, and was redesignated 496th (2nd Kent) Field Company on 1 February 1917. It joined the newly formed 74th (Yeomanry) Division on 24 March 1917. On 25 May the company was transferred to 53rd (Welsh) Division and then transferred again on 4 July to 75th Division. It remained with 75th Division until the end of the war, operating alongside two companies of Queen Victoria's Own Madras Sappers & Miners of the Indian Army. It is not known in which specific actions Frederick took part in during his period in Palestine. He contracted malaria and was hospitalised in the 47th Stationary Hospital, Gaza, Palestine, where he died of malaria and pneumonia on 23 October 1918. He was 27 years old. The Western Gazette, in its edition of 29 November 1918 reported "Mr and Mrs C Poole, of 10 Seaton Road, have just received information that their eldest son, Private FC Poole, has died at the 47th Stationary Hospital, Gaza, Palestine, from malaria fever and pneumonia. Private Poole joined the 2nd/5th Somerset Light Infantry three years ago from the Post office, Cheddenfold, Surrey, and proceeded to India in March the following spring, and from India to Palestine where he went through all the fighting with General Allenby’s troops. He has two other brothers serving, one in Palestine and one in India. Mr and Mrs C Poole of 10 Seaton Road, wish to tender their sincere thanks to all kind friends for their tokens of sympathy extended them in their irreparable loss sustained by the death of their eldest son." 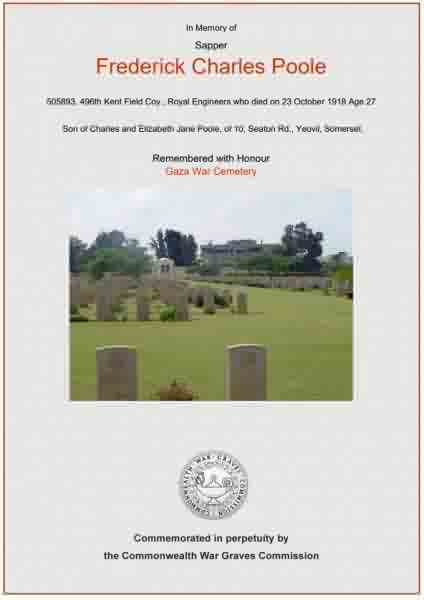 Frederick Poole was interred in Gaza War Cemetery, Israel - Grave XXVII.E.I. His name is inscribed in the Somerset Roll of Honour and on the War Memorial in the Borough. The Commonwealth War Graves Commission certificate in memory of Frederick Poole.